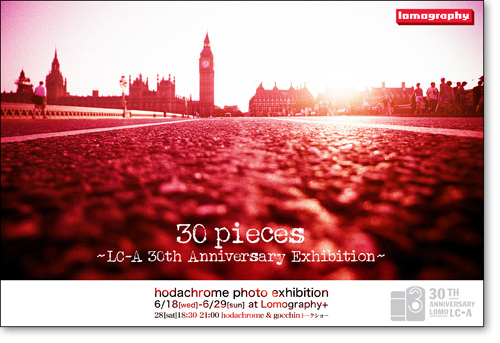 The invitation of hodachrome's photo exhibition "30 pieces" ~LC-A 30th Anniversary Exhibition~ (Tokyo). Photographer hodachrome (Hodaka Yamamoto) is going to hold a lomographic exhibition at Lomography Japan,Tokyo, as part of "LC-A 30th Anniversary" events. All the photos are taken by mainly LC-A/LC-A+. You can see 30 of my representative works such as multiples, cross-processed, redscaled, EBS and other unique works. I would like you to enjoy my dreamy and fantastic analogue-world. Also, we will have a "talk show" featuring with gocchin (Yoshitaka Goto) on 28th. Details: Notice of "hodachrome x gocchin talk-show"
I am very excited to meet you guys in Tokyo!! I will be at the gallery on 21, 22, 28 and 29th. Copyright © ***Dream or Reality? *** All Rights Reserved.